Susan Smith holds her son Witson as her daughter Louvencia plays with a book at the family’s Durango home. Smith and her husband, Michael Blumhardt, were in the process of adopting the two children last year when the earthquake struck. Michael Blumhardt holds Witson while Louvencia plays and his wife, Susan Smith, holds Matthew and Amy. Editor’s note: It has been a year since a 7.0 magnitude earthquake ripped through Haiti, leaving in its wake billions of dollars in damages and more than 300,000 dead. In a three-day series, which ends today, the Herald has checked back with people whose involvement in Haiti has stretched beyond the initial weeks after the tragedy. Susan Smith said she never could have imagined this scene a year ago – her husband, Michael Blumhardt, sitting on the living room floor with her and the playful chaos of four children swirling around them. At this time last year, the couple was watching in horror as a 7.0 magnitude earthquake struck Haiti, home to two children they were adopting. After the earthquake, they went through a nerve-wracking process to bring the youngsters, Witson, 3, and Louvencia, 1, to the United States. It ended when Blumhardt, an intensive care physician at Mercy Regional Medical Center, flew to Haiti to bring the children home. The year since the two arrived in Durango has been challenging, Smith said. The couple also have two biological children, Amy, 6, and Matthew, 4. Today, they said they couldn’t imagine their family any other way. 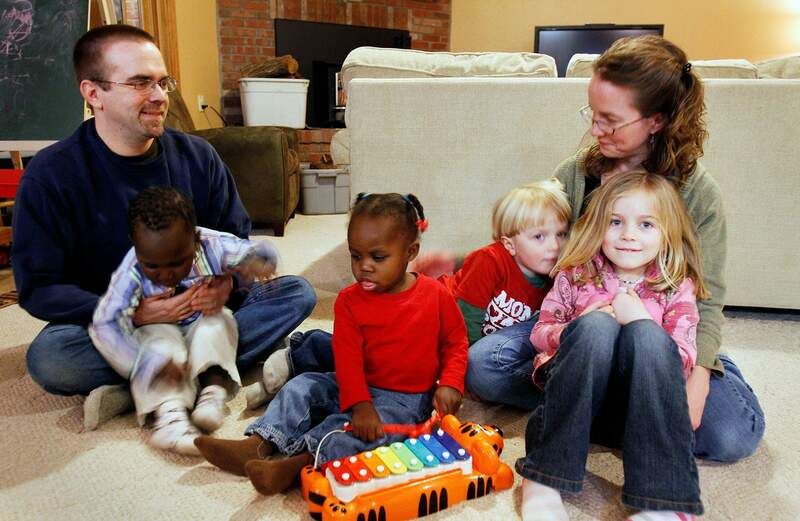 They officially adopted the Haitian children June 28. After recovering from a life-threatening fever contracted in Haiti, Louvencia has blossomed into a fearless, “totally curious” little girl, Smith said. She’s warm and affectionate, and she loves babies, Smith said. “She has all of her older brothers and sisters wrapped around her little finger,” she said. Witson has developed a sharp, Type A personality, Smith said, and he wants to know where everyone is at all times. The code of the orphanage, where all the kids look out for one another, still is ingrained in his personality, Blumhardt said. Life has changed since the family added two more members. Smith left her oncology practice and started home-schooling the children this year to give the family more of a chance to blend and catch up on the bonding they missed during Louvencia’s and Witson’s first years. The couple has tried to teach their children as much as possible about the country and the tragedy that defines their family. They answered a lot of questions and had a lot of discussions with the older children in the months after Witson and Louvencia arrived, Smith said. She also has spent whole weeks teaching lessons about Haiti, and the family plans to learn French, one of the country’s official languages. Witson now knows that he lived in Haiti. Haitian art is on the walls of the family’s home, and Smith has incorporated Haitian foods into her cooking. “I would say that Haiti probably doesn’t feel much of a connection to us, but we feel a tremendous connection to it,” she said. They regularly check on the orphanages where Louvencia and Witson lived and send money. The two oldest kids talk about living there someday, Smith said. The couple said they always will feel a connection to Haiti, although it took time to recover from post-earthquake fear that they never would see their adoptive children again. “We eventually stopped having Haiti nightmares in May,” Smith said. It took six months before they finally could bring themselves to watch news about the country. Thanks to the Help Haiti Act that President Obama signed into law in December, Louvencia and Witson will become U.S. citizens as soon as their paperwork is processed. Both parents say the family finally feels complete. The two just feel like naturals to the family, they said. Just the other day, Blumhardt said he was looking at a family picture taken around Thanksgiving 2009.